It's been a few weeks since I've had one (between work, travel and being sick there's not been time), but it's back again! FYI, the San Francisco 49ers are a pain to watch in person as I experienced firsthand in their loss to the Washington Redskins. I was there for Beathard's debut and the kid was impressive and has a bright future ahead of him, but I wish he had a better supporting cast. At least John Lynch and Kyle Shanahan are working on six-year contracts and have a chance to get him what he deserves. Anyways, on to this week's "honorees." QB -- Mitchell Trubisky, Bears. It's not because he only put up 4.6 points on Sunday, but it's because only threw SEVEN passes in a complete game. SEVEN. Quarterbacks in Pee Wee football throw more than that! I'm pretty sure Comanche High School throws more than that -- and the Indians run a Wing-T offense! Trubisky threw for 107 yards with Tarik Cohen providing 70 of them on one play. He didn't have a good day at all, but part of that is on the coaching staff, but the Bears also only ran 37 plays on offense and were 2-11 on third down. Trubisky was also sacked four times and barely outscored Dallas backup Cooper Rush who got garbage time action in a 40-10 Dallas win at San Francisco. RB -- Adrian Peterson, Cardinals. 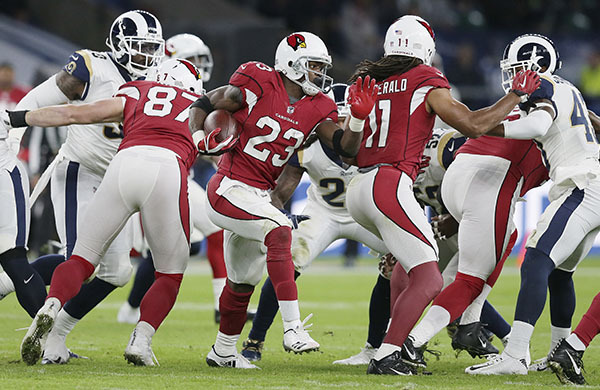 Carson Palmer broke an arm and Arizona needed to rely on its ground game to establish something on offense to control the clock and keep up with an explosive Rams offense. Enter Peterson and his awesome 4.3 fantasy points. Wait, that's not establishing a ground game. Peterson was expected to flourish after his trade out of the Big Easy, and after his coming out game last week, the veteran finished with 11 carries for 21 yards in a 33-0 loss. He also only had one catch despite being targeted four times. The Cardinals are on bye this week, so see how he gets used in Week 9 against San Francisco before deciding on if you should drop him or not if he's owned. WR -- Martavis Bryant, Steelers. Choose your reason as to why he is here -- there's the one catch for three yards, one carry for two yards or the 1.5 points he posted. You could could also go with him calling in "sick" to work on Monday if you chose. 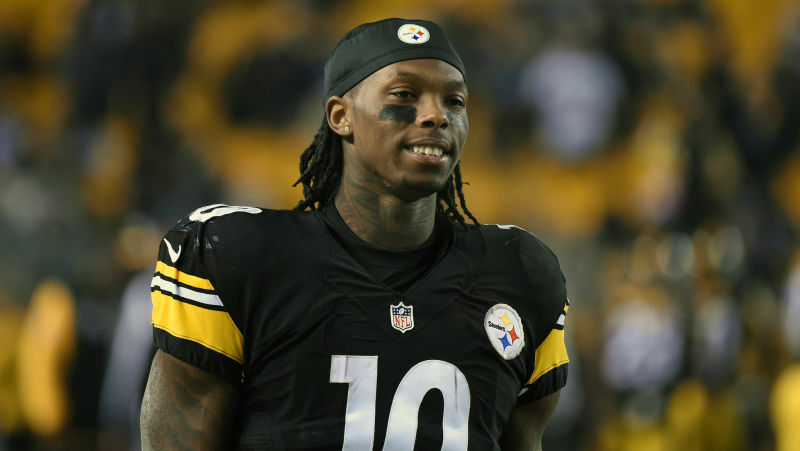 All in all, Bryant accounted for just five yards when the Steelers gained 420 yards as a team -- which given his history would have been grounds for another suspension. TE -- Rob Gronkowski, Patriots. Gronk just hasn't been consistent this year as he's had three games with 22+ points and then games with 5.3 points (KC), a game he missed due to injury (@TB) and then only had 8.1 points in Sunday night's Super Bowl LI rematch against the Atlanta Falcons. He had just three catches on seven targets for 51 yards and no scores. He was the 20th ranked tight end this week heading into Monday night. D/ST -- Raiders. For the second time in three weeks, the Raiders D/ST cost you points if you started them as they allowed 30 points to the Chiefs. It was also the third time in the last month that Oakland failed to force a turnover. Oakland also recorded just one sack of Kansas City quarterback Alex Smith and have a matchup with the Buffalo Bills looming this week. All told, the Raiders have a combined 0 points in the last three weeks. K -- Dan Bailey, Cowboys. He pulled a groin and the Cowboys had to turn to safety Jeff Heath for kickoffs and extra points. Heath wound up making as many extra points in the game as Bailey did (although eventful as one clanged off the upright and one missed the kicking net altogether) and now Bailey is expected to be out for "several weeks."